Get the Funk Out! 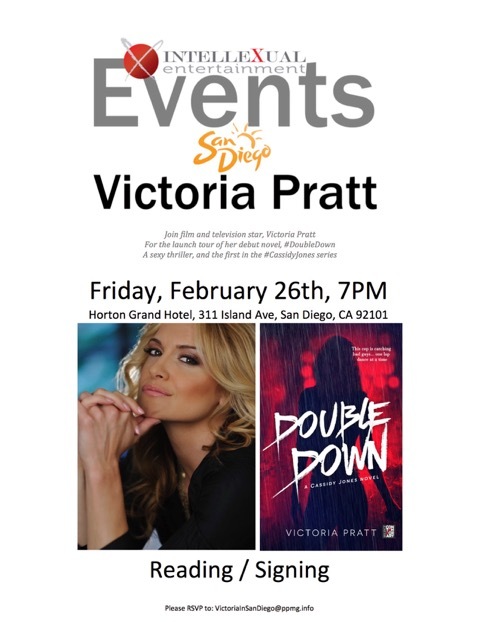 : Joining me today at 9am was the very talented Victoria Pratt, Film and Television star and author of “Double Down"
Joining me today at 9am was the very talented Victoria Pratt, Film and Television star and author of “Double Down"
Did you miss Victoria Pratt on today's show? Victoria has spent her adult life playing superheroes, supervillains, and cops on television and in movies. From her start on the action series, John Woo’s Once a Thief, to Marvel Comic’s Mutant X, to ABC’s Daybreak, to a mountain of Lifetime movies, Victoria has learned a thing or two about crafting strong female characters. Victoria’s writing career actually started long before her acting career, with a monthly column in Oxygen Magazine. Next came screenplays, women’s magazines, and finally, this, her debut novel, Double Down. Victoria spends her time between her home in the Hollywood Hills, and her family in Canada. Currently, Victoria recurs as Casey McMurtry on Canada’s longest running hour-long drama, Heartland, where she literarily… that’s right… runs the rodeo. On her first audition, Victoria Pratt landed a role on John Woo’s Once A Thief, soon leading to her becoming a series regular. Next came a recurring role on Xena and later, the lead in both Cleopatra 2525 and Mutant X.
Victoria next shifted to film, including roles in What Love Is, Murder At The Presidio, and Journey To The Center Of The Earth. She has also appeared in several pilots, as well as roles on CSI, NCIS, Cold Case, Ghost Whisperer, Life, Lie to Me, and Castle, and her lead role as an undercover homicide detective on the ABC series Day Break. Victoria’s most recent movies include Christmas Twister, A Nanny’s Revenge, The Virginian, the noir thriller Death Valley, A Daughter’s Nightmare, Patient Killer, and June. Currently, she’s enjoying a recurring role as Casey on Canada’s longest running hour-long drama, Heartland for CBC, and has also recently secured a publishing deal for her very first novel, Double Down. Look here https://eduessayhelper.org/blog/persuasive-essay for some interesting stuff! Sure, I will visit this site if you say so. I don't want to miss anything.